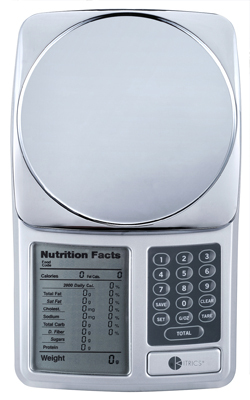 A scale and a calculator all in one, this essential dieting tool calculates portion weight, and displays all the information the way you’re used to seeing it on food packaging labels: an at-a-glance breakdown of calories, fats, carbs, proteins, fiber, sodium, cholesterol and sugars. You can also total your daily nutritional intake, and store up to 99 of your own food entries into a database of nearly 1000 others. So the experience is always customized to you, your goals and your lifestyle. Ideal for: portion control, medical requirements, type A personalities. Not just the weight, but the total breakdown. Calculates calories, carbs, fat and more.